Employee Turnover: Why And At What Cost? Employee turnover in Idaho slowed during the recession but is beginning to pick up again as workers become more comfortable in a reviving labor market. But the rate of turnover and characteristics of the workers changing jobs can have a significant economic impact on businesses. Employees stay on the job an average of 23 to 24 months before jumping ship or being laid off, according to the Bureau of Labor Statistics’ labor turnover survey, and at a cost that can substantially affect a business’s bottom line. According to the Census Bureau’s Quarterly Workforce Indicators, employee turnover was 9.1 percent for all jobs in 2011. That is up from 8.8 percent in the depths of the recession in 2009 but still below prerecession levels approaching 11 percent. The eight published census indicators capture the complexity of workforce dynamics. The turnover rate is determined by figuring half the ratio of hirings and separations divided by total employment. Highly seasonal employment patterns in industries like tourism and construction result in higher turnover rates. Temporary help services, part of the administrative and support services sector, share that consistently higher turnover rate. 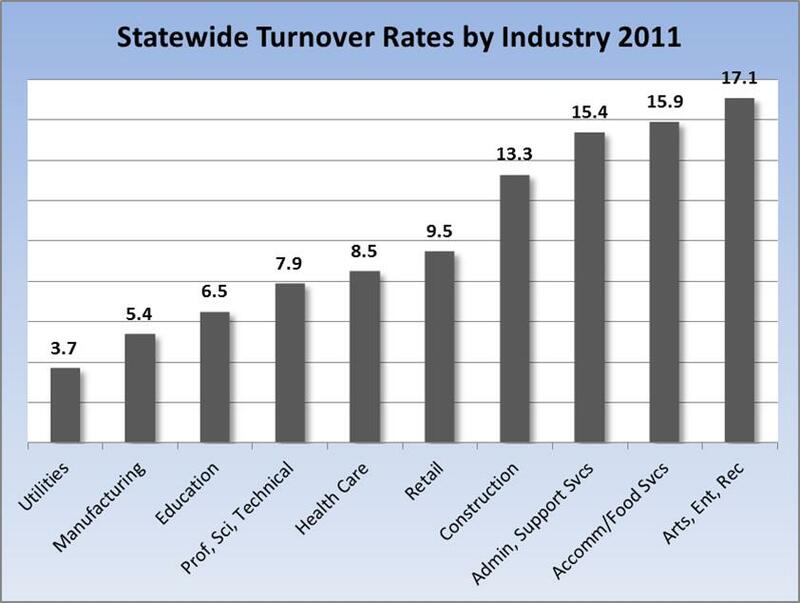 Industry turnover is a conduit to regional turnover performance. Northern Idaho maintains a higher turnover rate than the remaining five Idaho regions, settling in at 10.2 percent in 2011. The Boise hub in southwestern Idaho maintains the lowest turnover rate at 8.6 percent. Younger workers tend to be more transient and attracted to industries with higher turnover rates, which makes them more vulnerable to high turnover. As more and more people settle into their careers later in life, the turnover rates among age groups steadily decline until reaching retirement age when jobs become secondary in life. The newest of the turnover measures is size of firm. The larger the firm, the lower the turnover rate. Larger firms realize the cost of turnover and cannot afford to have as much turnover as smaller firms in pure numbers. Despite high worker turnover at small firms, the share of new hires that increase net employment is higher at small firms in Idaho relative to larger businesses. The census indicators recently started capturing the educational attainment of workers. According to the data, the turnover rate for people with a college education is lower than for those without. Wages also come into play. 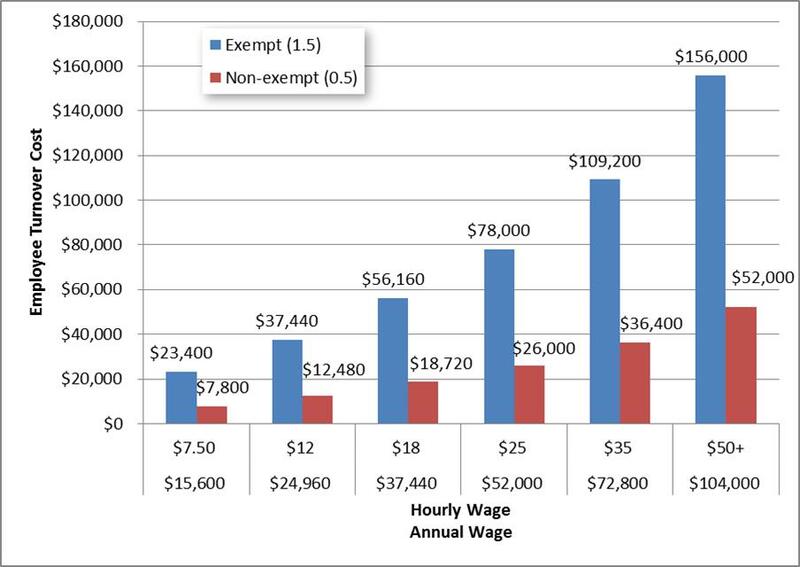 The cost of replacing a worker who earns $7.50 per hour is far less than replacing a $15 per hour position. There are significant business costs to replacing employees although those costs vary with the type of job. Among them are the costs of the hiring process, lost opportunity costs and lost productivity. The dilemma for employers is knowing how much to spend on an employee to ensure the employer is getting an adequate return on his investment. Knowing the cost of losing and then replacing an employee helps determine how much an employer can afford to invest in keeping workers or getting rid of them. There are several calculators, but according to PricewaterhouseCoopers, who offer human resource services to improve overall business performance, the cost of replacing an employee, who is exempt from coverage of the Federal Labor Standards Act, is 1.5 times the salary. The cost for replacing an employee, who is covered by the act, is just half his salary. The primary difference is exempt employers are not required to be paid overtime for work beyond 40 hours and are presumably in more managerial, supervisory roles. There is a wide range of estimated turnover costs depending on specialized training, the complexity of the job, productivity and educational requirements. Although conservative, the PricewaterhouseCoopers formula provides businesses with a foundation. This entry was posted in Employers and tagged Census Bureau, idaho department of labor, turnover rate, wages, workers on May 1, 2013 by Idaho Department of Labor.